Chinese authorities today made an unprecedented request to international authorities to help them find a number of terror suspects. 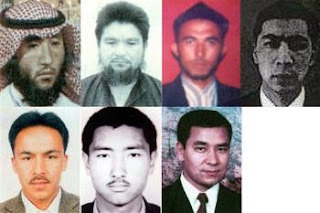 At a press briefing Wu Heping named eight men said to belong to the East Turkestan Islamic Movement. The men, named as Memetiming Memeti, Emeti Yakuf, Memetituersun Yiming, Xiamisidingaihemaiti Abudumijiti, Aikemilai Wumaierjiang, Yakuf Memeti, Tuersun Toheti and Memetituersun Abuduhalike, were said to be responsible for terrorist plots targeted at the summer Olympic games. They "seriously threatened the security of the Beijing Olympic Games and China's social stability, while at the same time composing a threat to the security and stability of relevant countries and the region" Wu told reporters [Xinhua / BBC / Fox]. During the lead up to the games there were a number of incidents. In Kunming, Yunnan province, two buses were targeted killing 2 people and injuring several others [tvnewswatch], though authorities have consistently denied it was a terrorist attack despite claims by the Turkestan Islamic Party [tvnewswatch / BBC]. And in the Xinjiang Uighur Autonomous region a number of attacks left more than 30 dead [BBC]. One attack alone killed 16 policemen and injured a number of others [BBC]. It is not only separatists in in Xinjiang and Tibet that are causing a headache for Chinese authorities. China is also fighting a constant psychological battle with Taiwan. Many people in the country support independence from China and today a protest boiled over with a Chinese envoy getting shoved to the ground. The attack on Vice Chairman Zhang Mingqing of the Association for Relations Across the Taiwan Strait was shown on television news broadcasts and comes amid improving relations between Beijing and Taipei under the administration of new Taiwanese President Ma Ying-jeou. Protesters shouting “Taiwan does not belong to China” surrounded Zhang and in the mêlée he stumbled to the ground [CNN / BBC].